This new hybrid has the potential to be totally amazing ! Rossioglossum Bob Hamilton was bred by Tom Perlite of Golden Gate Orchids and is a hybrid of Rossioglossum (grande x Rawdon Jester). 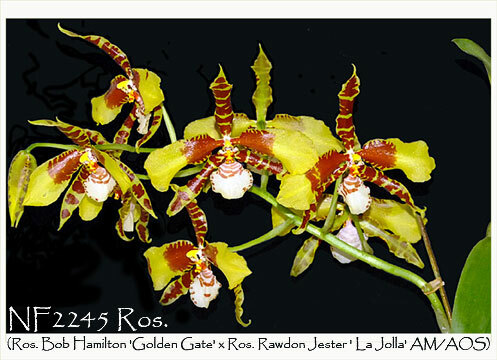 By breeding Rossioglossum Bob Hamilton back to Rawdon Jester, its flowers can reach up to 15cm with 8-9 flowers per inflorescence. An intermediate grower, provide medium light, in between lower Phal. light and higher Cattleya light. Definitely reduce the light in the summer to avoid burning the foliage. However, in the winter, prior to flowering, give brighter light during its rest period to help promote new strong growths in the spring. Highly Recommended !